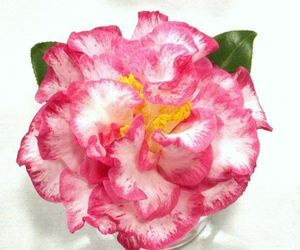 White medium to large sized, semi-double to peony shaped blooms are striped and blotched with red and pink. Feed through the season with complete fertilizer. Prefers acid soils, mulch. Keep moist until well established. Deep water regularly to keep soil moist.